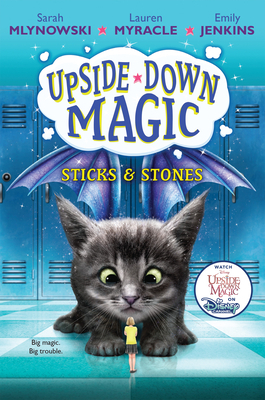 Strange things are happening at Dunwiddle Magic School -- and the Upside-Down Magic class is getting blamed! Yes, Marigold did shrink Lacey Clench to the size of a gerbil. But that was an accident. And, yes, most people weren't prepared for Nory to transform into a squippy (that's half squid, half puppy) -- but it's not like Nory meant to mix up paws and tentacles. And while Bax does have the unfortunate magical condition of turning into a stone, he swears he has nothing to do with the rocky magic that's been happening in Dunwiddle's halls. When things get messy, it's easy to point your finger at the kids with the messiest magic. But the Upside-Down Magic students aren't going to let themselves get in trouble. Instead, they're going to find out what's really going on -- and get their school back on track before something really wacky happens. Sarah Mlynowski is the New York Times bestselling author of the Whatever After series, the Magic in Manhattan series, Gimme a Call, and a bunch of other books for tweens and teens, including the Upside-Down Magic series, which she is cowriting with Lauren Myracle and Emily Jenkins. Originally from Montreal, Sarah now lives in the kingdom of Manhattan with her very own prince charming and their fairy-tale-loving daughters. Visit Sarah online at www.sarahm.com and find her on Instagram, Facebook, and Twitter at @sarahmlynowski. Lauren Myracle is the New York Times bestselling author of many books for young readers, including the Winnie years (which begins with Ten), the Flower Power series (which begins with Luv Ya Bunches), and the Life of Ty series. She would like to be a Fuzzy so she could talk to unicorns and feed them berries. You can find Lauren online at www.laurenmyracle.com. Emily Jenkins is the author of many chapter books, including the Toys trilogy (which begins with Toys Go Out) and the Invisible Inkling series. Her picture books include Lemonade in Winter, Toys Meet Snow, and The Fun Book of Scary Stuff. She would like to be a Flare and work as a pastry chef. Visit Emily at www.emilyjenkins.com. Check out our Wine Bar! Serving great wines from a local winery! We have partnered with Libro.fm to bring you the best audiobook experience, so you can listen to books on the go and support your local independent bookstore! Not sure what to buy? Get a Gift Card. We help you find the books you'll love!! !